De Leon Productions was excited to create this glamorous Champagne Chandelier from which our dazzling aerialist poured champagne for guests at the Union League Club of Chicago’s annual homecoming party. Self-lit and sparkling, the Champagne Chandelier hung from one of our freestanding aerial rigs (the amazing historical building in downtown Chicago doesn’t allow rigging from it’s beautiful ceiling). 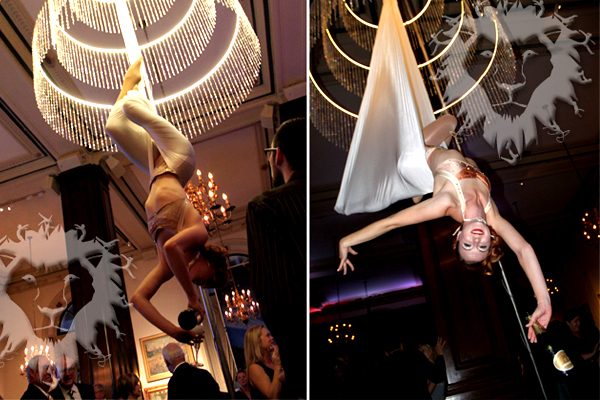 Bring some elegance to your event with this unique aerial bartender! In addition to the Champagne Chandelier, guests were greeted by our 40′ red carpet which actually turns into a fabulous red dress on a larger-than-life model. Dressed to the nines in crystal jewelry and feathered headdress, our Red Carpet Dress Lady is a fun way to impress guests right off the bat.